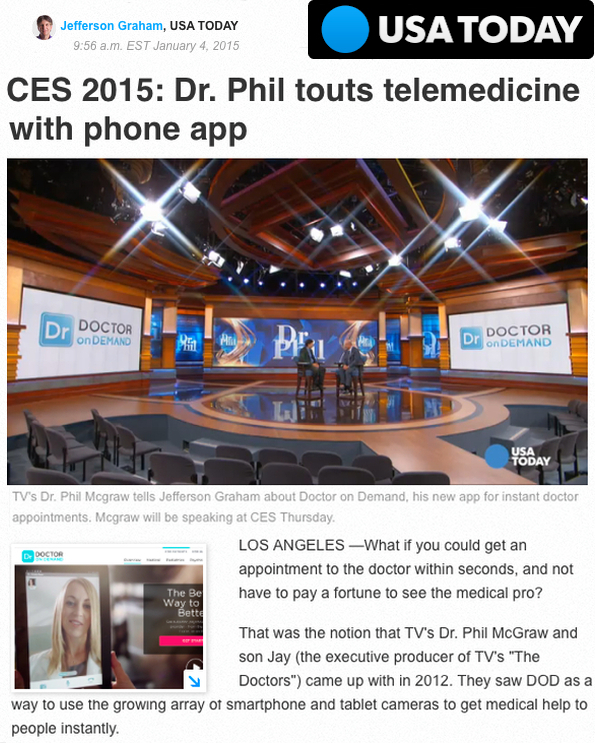 Don’t miss this interview of TV’s Dr Phil McGraw by USAToday’s Jefferson Graham ahead of the Consumer Electronics Show debut of “Doctors on Demand” a Google Ventures, Andreessen Horowitz and Shasta Ventures backed Mobile Video Doctor Consulting on demand service. I’m really hopeful that Dr Phil’s very high profile celebrity status will help Mobile Video Doctor Consults get the mainstream US media attention that the Presidents Favorite mHealth use case deserves as this is critical if we’re ever going to move beyond todays’ focus on the 2,000 year office visit model of healthcare. With more than a million free app downloads in just over 12 months Doctors on Demand has proven that there’s an enormous US consumer demand for help with simple health queries via their mobile (something that we observed here in the UK back in 2005) and I’m sure it’ll generate much greater awareness in the US of the opportunity for Patients and remote Doctors to work collaboratively on the informational challenges.